The joy of Google maps can only be augmented by more than just 3D buildings – these maps can also show users how those spaces looked as a different space in history. The new update to the navigation service is not a ground breaker. Rather, it’s a simple way to see things differently, with new photographs submitted by other users. Google’s Street View’s new timeline is conceptually similar to Bing’s historical mapping, which also use old photos. Unlike Google, Bing has been advancing its digital maps as smashups of old and new maps. Bing maps have also used user-submitted photos, but has failed to include a nice time machine interface like Google Maps. Now with Street View, you can see a landmark’s growth from the ground up, like the Freedom Tower in New York City or the 2014 World Cup Stadium in Fortaleza, Brazil. 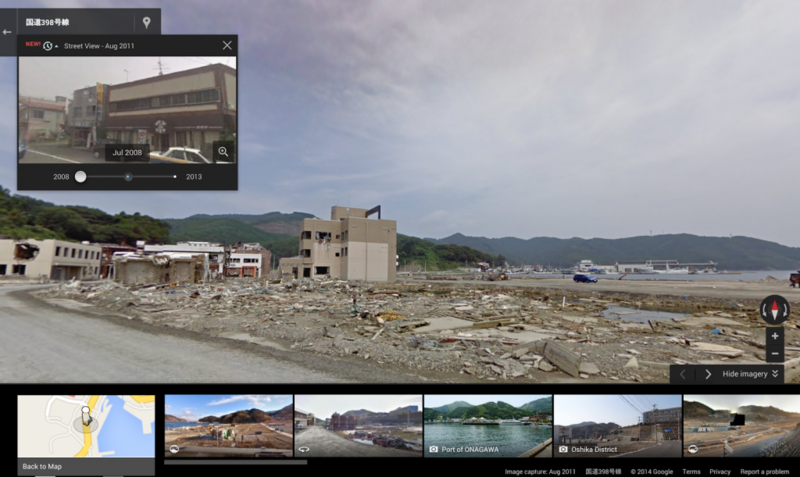 This new feature can also serve as a digital timeline of recent history, like the reconstruction after the devastating 2011 earthquake and tsunami in Onagawa, Japan. You can even experience different seasons and see what it would be like to cruise Italian roadways in both summer and winter. Sometimes, even when companies make great advances in mapping using the best technology, it’s often difficult to get users exited about their product. Google Maps’ is simpler and has a wider audience. It launches its new product with a sleeker way to move forward and back in time using photos. It’s nice, but it’s not innovative. It’s just very easy to use for most who have already chosen the platform. Currently Google Maps is the most preferred map app for mobile travelers, and that alone can create a captive audience because when they are done traveling in real space they might want to travel in just space-time.